Nagavi fort was the most recent addition to my list of forts. 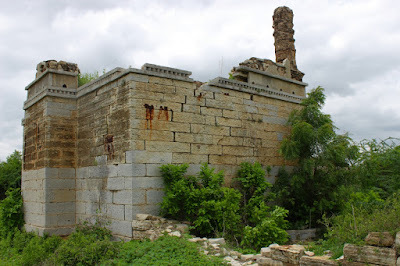 It was discovered while scanning Nagavi site ..a part of the site was marked with the word 'Kote.' 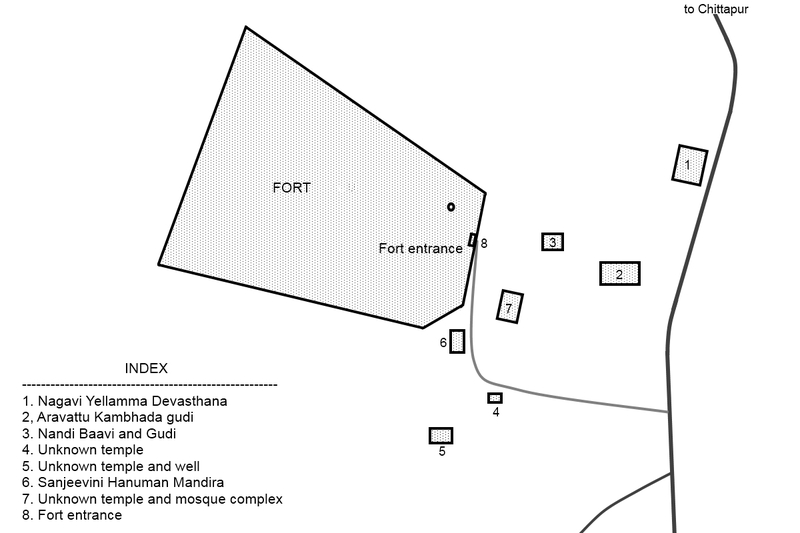 The fort's perimeter is approximately 1.7 kms around its 36 acres of plain land. 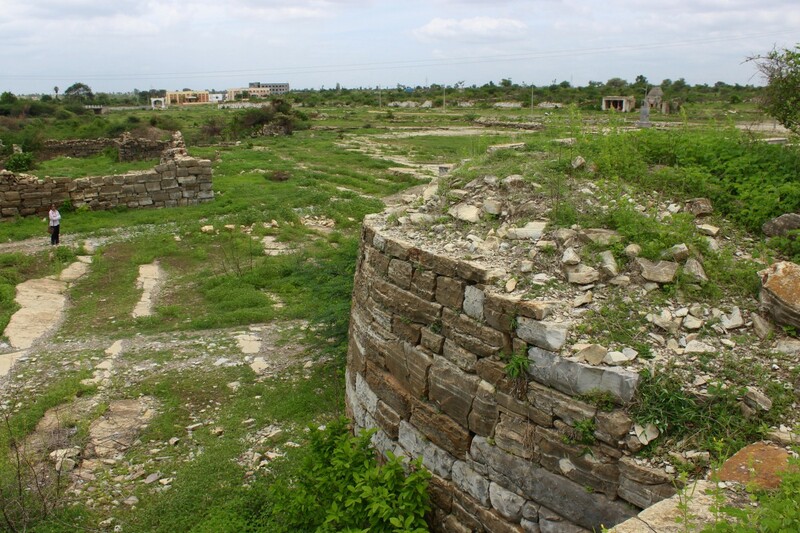 Within the fort are ruins of houses, water tanks and soldiers' barracks. So, it was a citadel ..a small fortified town. We started our tour of Nagavi with Sanjeevini Anjaneya Mandir followed by the temple-mosque complex with a stepped well. Next we walked towards the fort. 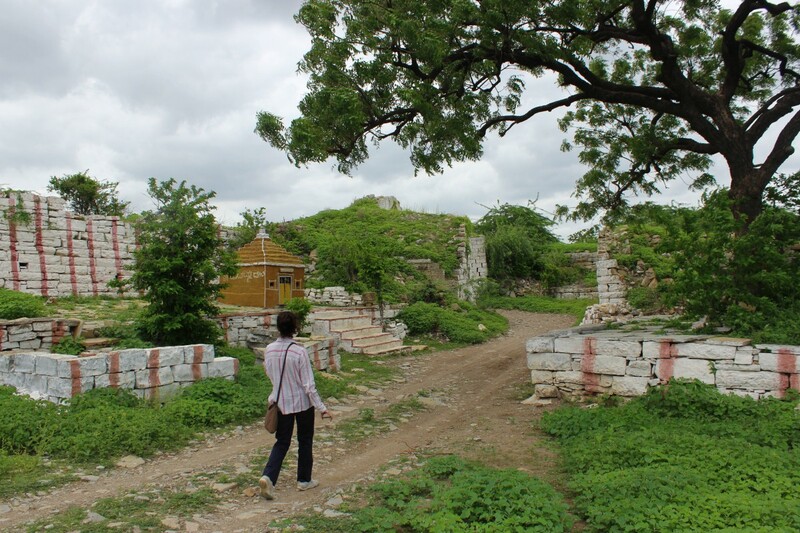 The path between Anjaneya temple and the fort is well tread ..mostly by cattle herds and shepherds. There were two-wheeler tire tracks too. 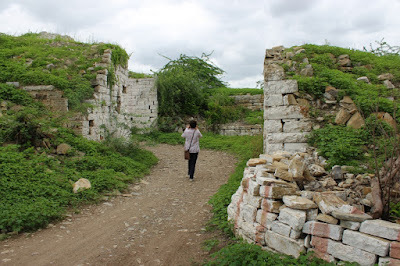 We walked along the fort wall which at places is more of dirt mound. 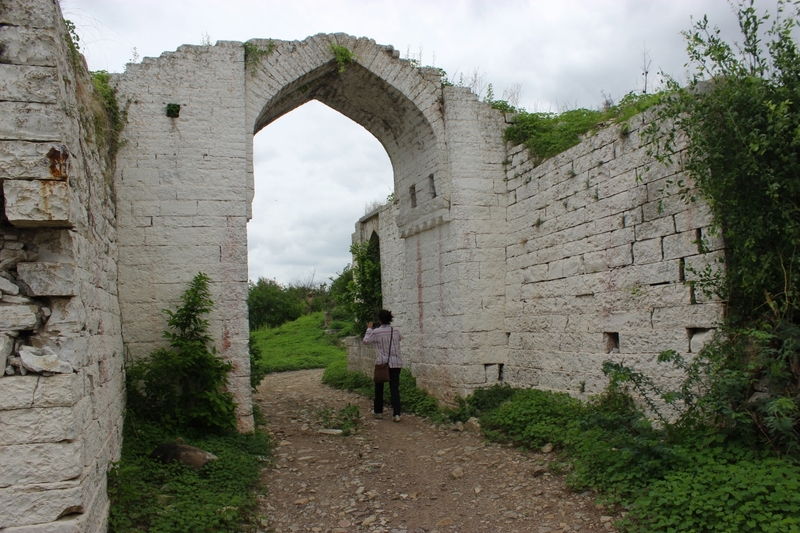 The fort entrance is recognisable, thanks to walls which have managed to withstand the forces of Nature and humans. Pushpa lead the way shooting the way with my mobile phone. 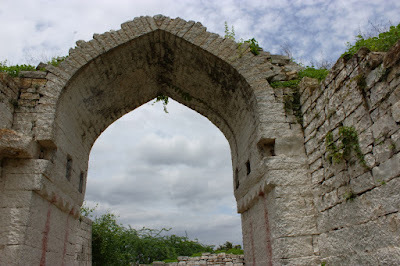 There we are.. arch of Nagavi's east-facing main entrance The arch design is Islamic, similar to the ones at Gulbarga / Bidar forts. This arch would be constructed during Bahamani rule but the fort as such was originally built during Chalukya's time. Close look at the self-supporting arch. An amazing piece of construction this is. The arch as seen from inside. 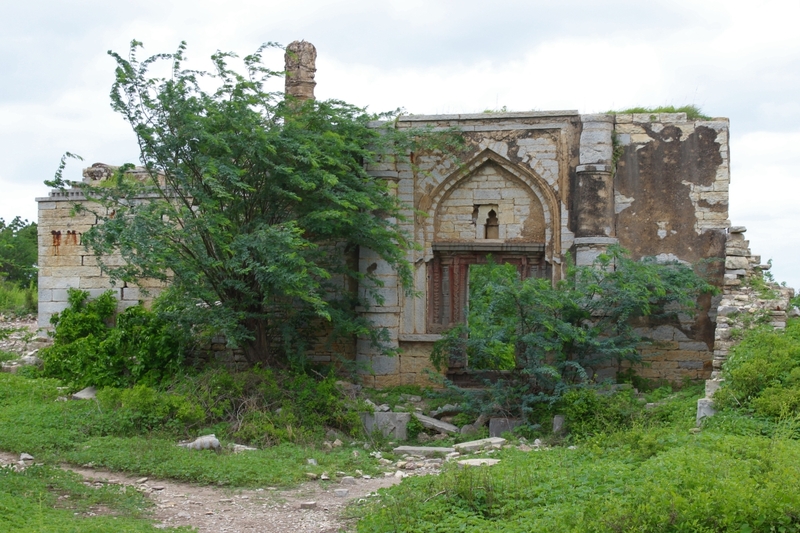 We just followed the foot path from here..
We reached this dilapidated structure. One of the online sources refers to this as Kali Masjid. Since the structure has one minar, I'll name it Ek-Minar Masjid. 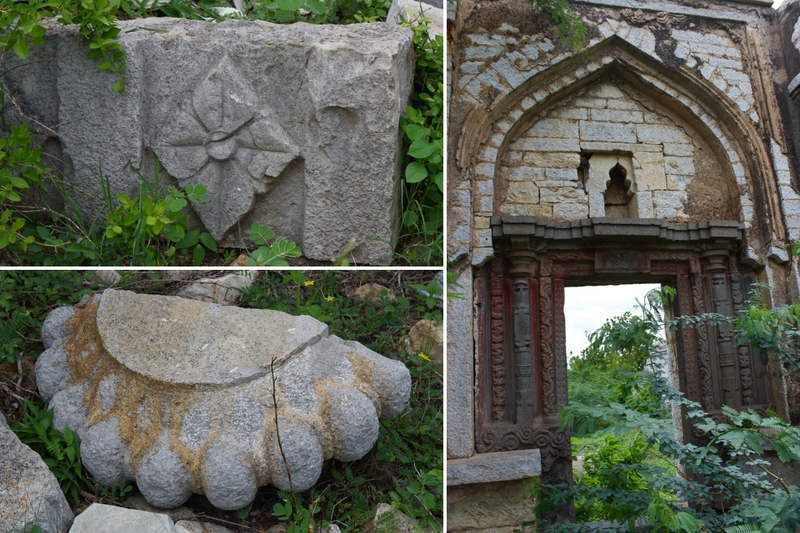 The entrance is decorated with an arch and an elaborately sculpted door frame. If you check the door frame'd head closely, the sculpturing has been defaced. Probably it was Gajalakshmi. Then there are other pieces of sculpturing which are typical to Hindu temples. 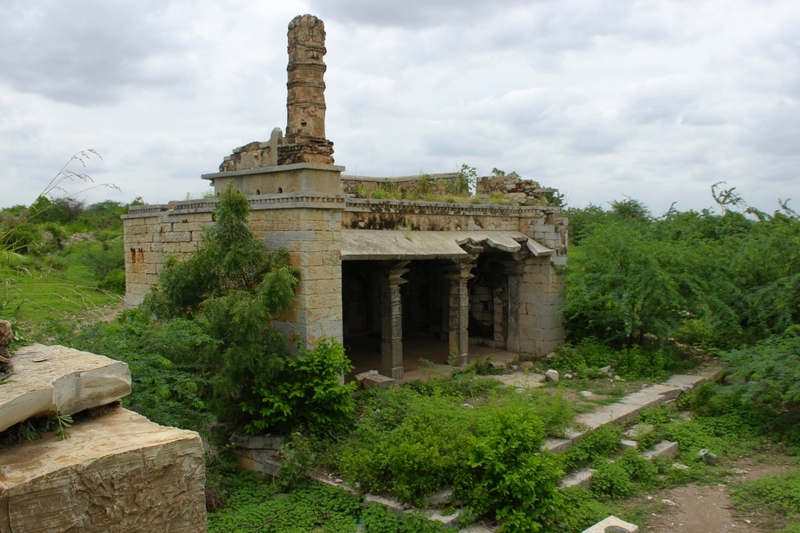 This structure was a Hindu shrine originally built during Chalukyan time and Muslim rulers who took over the place converted this into a mosque. Rear view of the shrine. Dresses Shahabad stone blocks have been used in most structures here ...temples, wells, rampart walls, gateways and arches. Wonder what's the original name of this stone.. i.e. before Shahabad came into existence. The foot path went further into the fort but we decided to end our tour here since we still had to see Aravattu Kambhada Devasthana and then reach Firozabad fort well before sunset. So we head back towards Anjaneya Mandir where our car was parked. Just before the temple, there's a bastion, I could climb over the ramp formed by the rubble. We were hungry and tired. Good thing we carried our lunch only thing we needed a good spot to rest and have lunch peacefully - that would be Aravattu Kambada Gudi, a short drive from here. Here's a map showing places of interest in Nagavi. 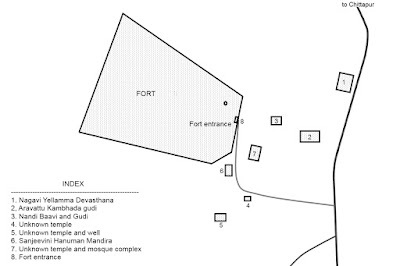 For reader's benefit- distance between Yellamma temple (1) and fort Sanjeevini Anjaneya temple (6) is approximately 800 meters.